Houston is a city in and one of two county seats of Chickasaw County in Northern Mississippi. The population was 4,079 at the 2000 census. Located just west of the scenic Natchez Trace Parkway at mile marker 243, beautiful Davis Lake, is an outdoor paradise. 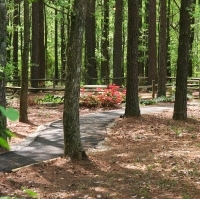 Trace Regional has a quarter mile walking path located on the facility grounds for employees and community enjoyment.